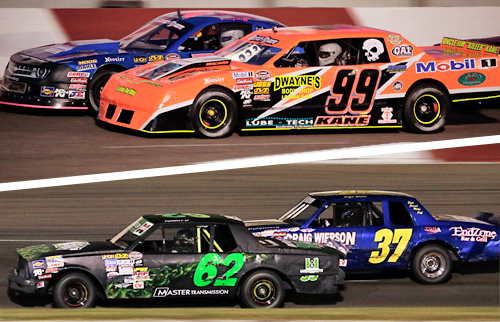 Elko race fans are also eagerly awaiting two other races being held on that same night. It’s Championship night in the Genz-Ryan Thunder Cars and the Pepsi Power Stocks. The main contender for Wolff is Brent Kane, he is known as the “King of the Thunder Cars” winning Championships at Elko Speedway in 2010, 2011, 2013 and 2015. They have similar stories, Kane also raced Late Models for a short time and then moved back to the Hobby Stock/Thunder Car division. Kane started racing full time in 1999 and won the Hobby Stock Championship at Raceway Park 3 times. He has an amazing total of 95 career feature wins. Elko Speedway is a NASCAR sanctioned 3/8th mile progressive banked asphalt oval racetrack in Elko (MN) located 30 minutes South of Downtown Minneapolis just off of I-35 and County road 2.